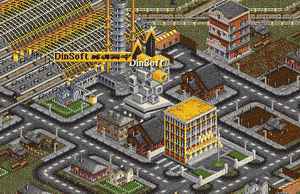 Dinsoft has now almost 1200 inhabitants. Not so bad, if you still remember that when were built our first office, there were only 54 people living there. Very soon there will be a new invention: Maglev. This is a new type of super high-speed train, where the train has no physical contact with the rails. Zero friction! The slowest models are already over 400 km/h. It can take some time before they are in production, we will see. There are pessimists and optimists. One of these optimists starts a new company. If they start with vehicles then they can survive a few years, if they go to make railroads; they will never come alive. We will watch them to see what they go to do. We got a message about an interesting subsidy. Starfingfield has not such a very good passenger transport, so this is a good opportunity to make one. The railroad runs a bit complicated and we have to build two new stations, but at August 31, we got the subsidy. September 27 we got the first UFO message of this year. the problem is that we don't get a message when it is destroyed. In that case we end up with damaged rails and a money losing train. Not so many special things in 2020. The new company stopped already its activities. Several other companies in trouble. We did get a subsidy and we had once more an UFO. We replaced some old trains. Now we go to wait for some new inventions. March 1. The special day is there. We got a message about a new rail system: MAGLEV. The speed of the new locomotive is 402 km/h. But it cannot run on the existing monorails, we have replaced all rails by the new Maglev rails. Our new Maglev construction box. 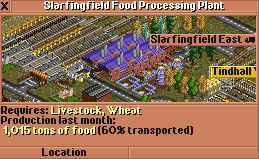 We will start with the wheat and live stock transport from Frondhead Farm and from Dinfingway Farm to Slarfingfield Food Processing Plant. Both farms have a very high production and only half of the products are transported. Even the Food Processing Plant has such a high production that only 60% of the food is transported. Here is some good work to do. June 16 the first two Maglev trains are running. Last year we replaced 6 monorail trains by the new Maglev models. We have still 71 more trains to do and to change all the rails. It's good that we have a good income now, more then 70 million dollars. Replacing the old Monorail by the new Maglev is a lot of work; first the old stations and rails has to be removed and then the build the new ones. Also a station has to be replaced as one part, half Monorail and half Maglev is impossible. Sometimes in a village with a station, the rating can be so bad that it is not allowed to build a new station. Then you have to wait a few years till they find you again a good company. June 5 two new trains for wheat and live stock from Frondhead Woods to Tindhall Woods. Our income is getting lower. This is mainly because there are several trains sent to the depot to replace the rails and the trains. One train less can give one million dollar lower earning. So we have to replace all trains as quick as possible. February 3, new train between Brubourne and Tindhall Woods. March 16, new train between Bufinghill City and Tedingville. July 14, new wood train from Tenington Woods to Sentwood Woods. On September 5 we missed an UFO message. The UFO was destroyed including the rails. It looks that we are only selling our trains; we now have several trains less than the year before. Most of these trains were old and need urgent to be replaced. Since this cost money and time, we just sell them and we wait until the can be replaced by Maglev trains. That's again our job for this year. July 15 we got a message about a new coal mine. With these coal mines we can make good business. Coal transport brings up a lot of money and the Fennville Power Station is not so far. November 21 we sold an old road vehicle, bus 21: We will not replace it. Our train income seems to remain at the same level; we have already for a few years 72 million dollar. The net income is much lower; we invested 44 million dollar in new trains: double then the year before. There are still plenty of old trains to be replaced. November 22, one extra train for wheat and live stock from Frondhead Woods to Tindhall Woods. In the mean time we got several messages about old trains and old buses. All old trains were sent to their depot and not yet replaced. The buses were all replaced. The last message was about Frondhead Paper Mill close down. "Supply problems" means that no one transports wood to this paper mill. We have to continue with replacing the old monorail trains by the new Maglev models. At this moment we are about half way, still a few years to go before we are finished. The train income was a bit higher then the year before. February 12, new coal train from Betown South to Fennville Transfer. This is not a replacement, but a complete new service. July 30, our competitor, Hunley Market Transport had a bad day: one more of his vehicles collides with our train. They have now only one Armored Truck left. On August 1 we got an interesting offer for a wheat subsidy from Wrefingbourne Farm to Frondhead Food Processing Plant. Not only the transport distance is good, but also the production, 180 tons, so, let's do the job. October 2, the new wheat train is in operation. We had to make a special tunnel to reach the food factory. Without this tunnel it would be very complicated. When the first train arrives, it earns 184 thousand dollar. Not to bad. Now we have also to setup a live stock train and the food transport train. November 23, the live stock train starts loading at Wrefingbourne. Our earnings are going upwards. We have now 70 trains, about 45 new Maglev trains and 25 old monorail trains. Furthermore we have 9 road vehicles and one aircraft. This new year we have to continue with replacing monorail with Maglev. January 15, UFO lands near Overingway. December 25 was found that the train between Dinfingway and Saston had a problem; there is no depot. It was possible that during a re-organization the depot was demolished and not rebuild. Last year we started to sell all our old monorail trains. January 13, the last one was sold. Now we cam continue with replacing the monorails with the Maglev rails. We have now sold all old trains and we have 63 new trains. Therefore is our train income is again lower then before. We have to continue with construction of new rails and buying new Maglev trains. The first of February we got a new locomotive. This on is even faster then the one we have already. This will be the new locomotive for the future. In the mean time we got some offers for subsidies, so we will try do get these. August 6, the new train for the first subsidy gets on its way to Nunton. August 17, we got the subsidy for this service. September 14, we got also this subsidy. We got now all subsidies, so we can continue with our normal work. Another decade finished. Ten years of hard work to get the new Maglev Trains introduced. WWW transport has now 74 trains. Our income is improved a lot; it was just a bit less than hundred million dollar. We got about twenty million dollar more then the year before. Our new trains are doing well.